This low-carb raspberry mousse is a classic dessert with a twist - skip the gelatin and add sugar substitute for a delightful and inspirational finale to your meal. The mousse made quite a few appearances at dinners and family parties and everyone just loves it. Everyone will clamor for a second (or third!) serving. The mousse is easy to make even if you are a novice cook. This is a speedy recipe for busy work days and tight schedules. Raspberry mousse is a beautiful, homey dessert and our favorite. You can also use your fruit favorites. The kids licked their glasses clean. Lemon curd: Mix the eggs, lemon juice, and salt and use a stick blender to combine well. Move to a saucepan, heat, and stir regularly. Remove from heat when the mixture thickens and add the butter. Stir to combine well. Leave aside. Combine the sugar substitute, vanilla, and cream and whip. Then combine the raspberries, cream mixture, and lemon curd. 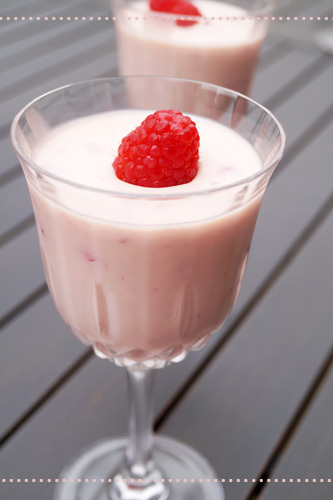 Divide into 4 glasses or dessert dishes and garnish with raspberries. You can use fresh or frozen raspberries.